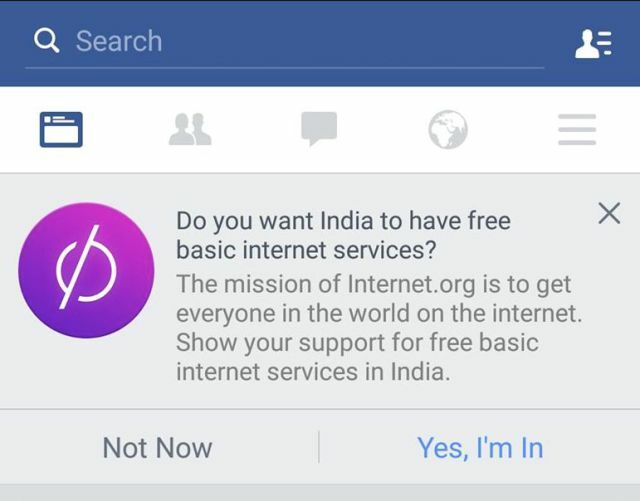 The prompt asks users to “show your support for free basic internet services in India,” a sentiment that is difficult to disagree with. Indeed, that must be why Facebook does not provide the option to disagree. The only possible responses are “Not now” and “Yes, I’m In”. Facebook exerting its will? I’m thoroughly and completely shocked. All snark aside, Facebook’s message here leaves no room for dissent, and that’s troubling. India can either embrace internet.org now, or begrudgingly accept it later. Even worse, internet.org’s only onramp to the “internet” leads to Facebook-approved content. Not only is Facebook nudging India into its free internet, it’s controlling the content Indians see. Of course, whatever service internet.org can provide is optional to the people of India. The message here isn’t that Facebook is somehow forcing anyone to use internet.org, but that it doesn’t readily allow India to imagine a world outside of it. Much like users of the service won’t be able to see a word outside of Facebook’s approved content. The stated goal of internet.org is to ‘connect the world’; we just didn’t know it was Facebook’s world we’d be forced to embrace.